Many people want to add music or sound to a PDF file. It would be an addional fancy element to the reading experience. In this article, there is a step-by-step instruction that you can follow in order to create sound PDF file. The sound or music is going to play when the PDF file is opened. 2. After clicking the “Add Sound” button, you are able to see the “Add Sound” window on your screen. You should tick the box saying “Embed contents in the document”. 3. Then you will have an option to upload your audio file that you want to embed. Choose your audio file and click “OK” button. Up to this step, you are able to upload your favorite audio or music file into your PDF file. 4. You should set the audio file to play when the file is opened. Click on the “Setting” button. Select the rendition option. You should choose the “Page Open” option if you want the audio file to play automatically. You can also select the other options. For example, you are able to set the audio or music file to play when the readers click on several images. After selecting your favorite option, you can click “OK” on the windows. 5. Close the “Add Sound” window after you’ve finished the process. If you have an e-book, you are allowed to embed several audio files into a PDF document. In order to add multiple audio files, you have to repeat the whole procedure for several times until you get all audio files in your PDF file. Those are some effective tips that you can use in order to insert one or more audio files to your PDF files. Adding music or sound to the file can be the best way to make your PDF file look interesting and exciting. You can deliver your message clearly by using some audio files in your PDF file or documents. 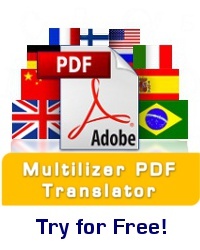 Translate your PDFs from one language to up to 27 languages. Just select files and languages, translating is 100% automatic. Get a new file with the translated text and all the images and tables in the original layout.